Container technologies have substantial benefits especially given the need to isolate applications to increase service levels. Both LXC and Docker containers provide application sandboxes so that if a security flaw is exploited or a containerised application is compromised, it’s unable to affect other applications and services running in other containers. But which one is right for you? 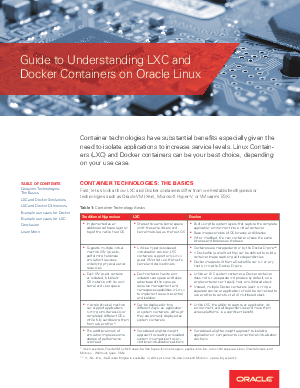 This guide compares different use cases for Linux Containers (LXC) and Docker containers so you can decide the best choice for your organisation.